Osteria Le Logge, not 50 yards from the Campo in Siena, normally wouldn't be a restaurant I would choose, due to its proximity to a famous landmark; these places are touristy and terrible. But Le Logge is different. They are also a Brunello producer, are noted in the Gambero Rosso guide, have their own cookbook, and limit the menu to a few choices in each category to what I would consider classics. Yes, it's an institution of traditionalism, but it seems to serve them and their guests, well. One wine with the entire meal, Gianni Brunelli 2010 Brunello di Montalcino - this is a more traditionally styled Brunello. Not heavy on the palate with oak or fruit or tannin, but softer, more anise and earth on the nose than fruit notes. Paired up great with each dish, save the foie. I'd love to see what happened in 24 hours and how it would have developed. The food and wine were one, not only because I finished the bottle, but because this wine was crafted to be elegant and not overpowering. To start, ham and eggs with toast. I'm poking a little fun here about my description, but upon presentation, that is the first thing in my head. The cracker of amaretto was both sweet and texturally playful in a world of oozy eggy hamey goodness. The local Proscuitto was similar to the lonza that I cured a few years back, ripe and wild flavors with great texture when sliced thin enough. The egg was sous vide and served at room temp, not hot. The liquid around the egg and the base of the plate was hot, while the egg remained cold in the center. I ate the dish with a spoon and bread. If I'd been polite and used a fork, I would have missed out on three-quarters of the dish. 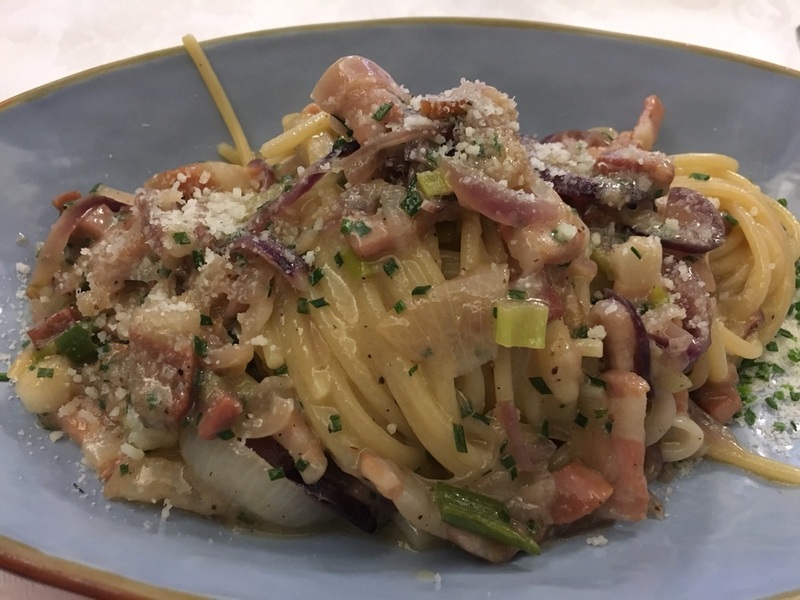 The pasta was spaghetti "Faella" with onions, shallots, green onions, and pancetta. I've basically made this dish in Italy about 5 times or at least a version of it. This pasta confirmed that the pastas I have been cooking at the apartment have been seasonal, because of the onions, the cabbages, the chicory and lettuces that are in season. I thought I was being unoriginal with my thought process, doing a version of this pasta in Lucca and here in Siena; but I was thinking properly, seasonally. The use of cured meat also makes sense, that was the whole reason you cure in the first place, to use it in winter. No tomatoes. No squash. No eggplant. No peppers. No summer fruits and vegetables. Lamb shoulder en croute. The lamb was thick cubed and cooked sous vide. There was no other way the lamb could have been this tender unless there was a sous vide machine involved. The spinach, however, made this dish. The spinach was sweet and has nearly none of the oxalate that dries out your mouth. The en croute was a phyllo dough applied just prior to finishing the lamb in the oven. 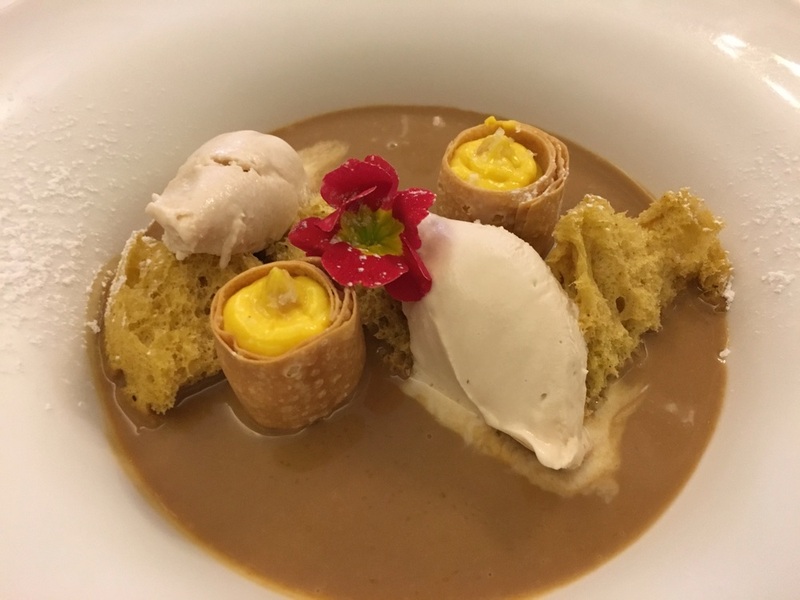 This is continental cuisine with the use of a modern sous vide technique. Bonus from chef. Cold chicken liver pate, dredged in curry/tandor spices, a quick grape jelly and avocado. I told the owner that this was a version of a dish I had at Robuchon with eel and avocado. The play on textures and flavors is there. Fun, yet cross cultural. The curry style spice mixture was powerful, so wine pairing will temporarily be on hold until you have a coffee or grappa. Dessert was liquid Gianduja puréed in cream or mascarpone with hand-torn pieces of doughy bread. Then if it wasn't rich enough, pastry cream filled cannoli and add some creamy gelato to the mix. It's sweet, rich, mouth filling and the perfect end to a really savory meal. The dessert was fantastic. Il Campo for the 2009 Palio in Siena, my shaved head in the foreground. A delightful afternoon at Le Logge. 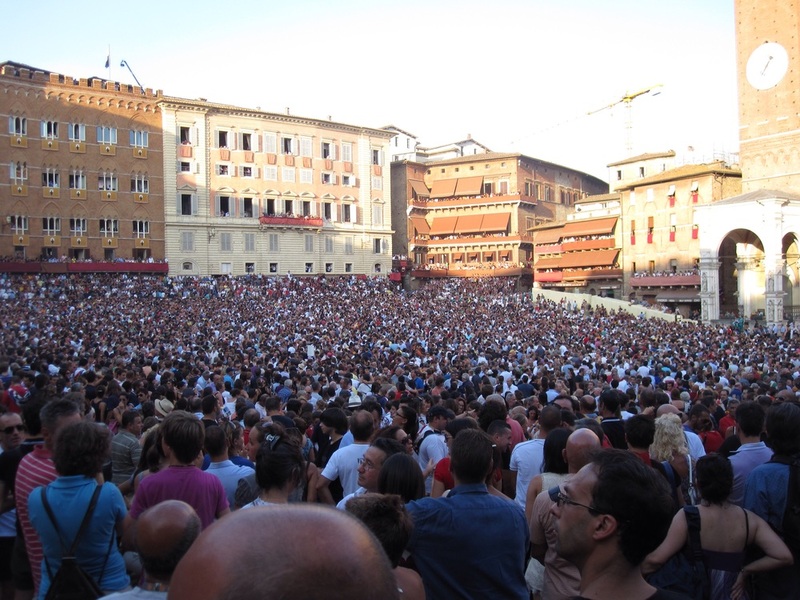 It's hard to believe that back in 2009, not 35 yards away I was in the middle of Il Campo for the Palio. Good times.